That’s the second time I’ve used this title, and of course it is not mine. Last night to the SOH to hear the SSO under David Robertson and a cast of guest singers do Strauss’s Elektra. The picture above is the afternoon before the last time I went to see this, just under 6 weeks ago, in Leipzig’s gloriously Stalinist opera house. An earlier report on the same production by Wanderer is here. There Eva Johansson was Elektra. And just to put everything in proportion, the night before the same orchestra under the same conductor performed Die Walküre and Ms Johansson was Brünnhilde in that. In Sydney, I sat in row V of the stalls on the violins’ side. The SSO placed the orchestra – reportedly about 110 [I am now told 103] – out in front of the normal stage in the space usually taken up by the stalls to about row L or M. The stage itself was given over to an elevated platform on which 8 or so dancers from the Sydney Dance Theatre did some “interpretative dance” and on which Elektra herself occasionally prowled around. Only in the final moments of Elektra’s dance, presumably the inspiration for the idea, did the two become really integrated: before that, for me, the dance was a distraction which added little. The concert hall’s acoustic rings were hoisted way out of, if not sight, then certainly any operative effect, which they could hardly have had once the orchestra was relocated in any event. Elektra is an opera which poses a balance problem. When the SSO and Australian Opera did it together in the Capitol in 2000, one thing Simone Young and others remarked was the serendipitous resolution in that venue of this problem – everybody could be heard. Bringing the orchestra forward but not really in a pit exacerbated that problem – a big orchestra is pretty loud. Even so, loudness was not really the problem for me, but rather clarity. Everything was enveloped in an echoic bloom. Peter McCallum, writing in the SMH, has said that the singers were amplified. I myself wondered that, especially because Christine Goerke had such an enormous voice and some consonants came over with a kind of super-resonance, but I couldn’t go so far as to say that was the case: the sound still came from where the singer was, which is an indication otherwise, and I know stages can have some echo on them anyway. Anyway, it was the orchestral sound which frustrated me. What I missed was all sorts of detail which I knew, from my Leipzig experience, is there to be heard. Different colours of string sounds; wind writing which is more than the emergence of the odd highlight from a generalised pitch aureole. The only bit where the acoustic really worked was in the trombone portents on Orestes’ return. Clytemnestra’s song about wanting to be a mother lacked the (relatively) gentle lyricism which could contrast with Elektra’s more frenetic moments. The solo-string writing was scarcely audible or distinguishable. The sum of this was a restriction of the range of mood and [affect? ]effect: there was just so much unrelenting and indiscriminate LOUD – and I know the work isn’t simply that. By the time we got to the amplified off-stage voices, a mark had been well and truly overstepped. One advantage of concert performances by the SSO is that the vocal casting can be luxurious by Sydney operatic standards. Goerke was phenomenal; Cheryl Barker as Chrysothemis had to force her tone a little in her lower register but had exemplary diction; Lisa Gasteen as Clytemnestra was much better than reports had led me to believe; I’m sorry to say that Peter Coleman-Wright seemed miscast as Orestes, though he could have been better in more favourable balance conditions. Pascal Herington had a good if brief moment as a servant. Indeed this was not a simple concert performance. Apart from the dance, the singers all acted their roles sans score. That’s a plus, but it’s still a long way short of a fully produced opera. 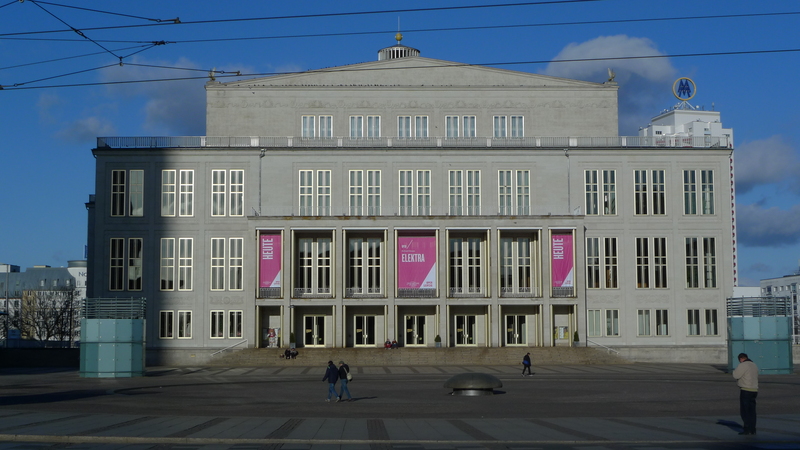 This sounds boring of me, but for the SSO’s next big-orchestra opera performance (and we can assume more are planned: my nomination – Jonny spielt auf), I’d like to see the orchestra back on the stage with the acoustic rings performing their (albeit insufficient) role. I’m happy to do without the dancers, and I would put the singers on an extended stage in front of the orchestra. To be fair most of the audience loved it. Maybe Leipzig spoiled me.